How the language was evolved? The theory of language orgin has been researched and debated since ages. Since the language is so old and there is not enough ground to argue, some people discourage the discussions and arguments on it. In 1866, the linguistics society of Paris, France banned the discussion on language origin. But the fact is, it is very interesting and involving topic. The students of linguistics must take part in the discussion. There are many theories about the language origin. let’s discuss them one by one. Language is naturally built in humans. This theory says that language is part of humans as eyes, ear and nose etc. They believe that if two new born babies are kept in segregation from the rest of the community. They will develop their own language. This theory has been challenged many times in history. Psamtik was an Egyptian king who ruled 664–610 BC. He did an experiment to know the root language of humanity. He kept two new born baby in isolation from the rest of the world in the company of a shepherd who himself was deaf and mute. The kids were able to speak just one word “bekos”. In Phyrgian language “bekos “is the word for bread. So it was believed that Phyrgian was the language of the God or the root language. But critics say that Greek historians might have added kos at the end of “be”. The word “be” is exactly how the goat speak. So the kids could not produce any language of their own. They just spoke what they learned from the environment of goats. King James from Scotland also carried the same experiment with two new born babies around 1500. It was reported that the kids started speaking Hebrew . Thus making Hebrew the language of the heaven or the root language. May other experiments were also carried out but unfortunately not a single experiment confirmed that children can start speaking language on their own. So it was concluded that children growing up in isolation do not develop any language of their own. The bow wow theory says that sounds all around us were the source of language. 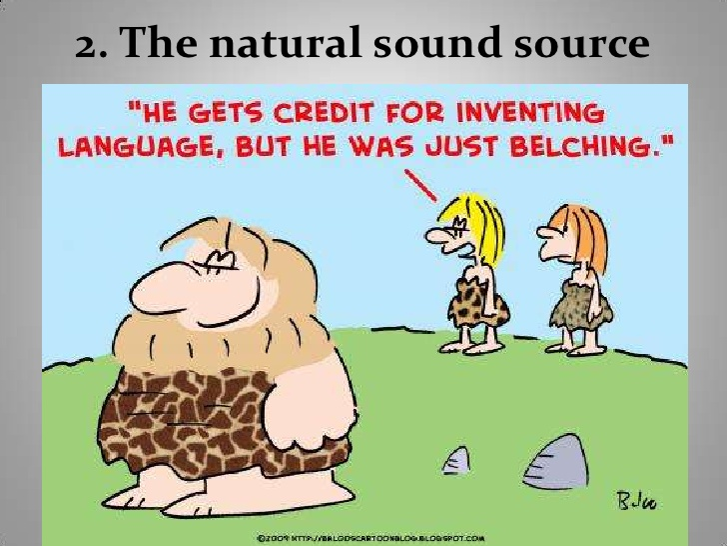 This theory shows the co-relation between some words and the corresponding natural sounds. For example the bird with sound coo-coo is called cuckoo. Similarly bow-wow is referred to dogs and caw-caw is referred to the crow. Other examples are like rattle, splash and bang etc. This theory has convincing argument but such words are really few. Most of words have not such correlation. The theory goes further to suggest that the natural cries of happiness, grief and pain may also be the source of language evolving. The words like ouch, Aah, wow and ooh etc are natural response in case of sudden emotional situation. But if we analyze these words and the language. we come to know that the natural language words are produced while we exhale the breath. Whereas these sudden cries are produced while we inhale the breath. So again it falsify this theory. The following funny picture found on the internet summarizes it all. Humans used to live in groups. Living in group is not only human nature as they say man is a social animal, it was also need of the time to save themselves from wild animals. While living in forest, they mostly survived on hunting. As we observe, hunting is a group activity. Mostly mammal predators like lion prefer to hunt in group as well. When man learned farming, again it was a group task. So while living in groups, the social interaction gave birth to vocabulary formation. At some point, while exerting force, lifting heavy objects or running after the prey, some instantaneous word spoken by some one became a new addition to the language and thus adopted by the whole community. The same process is still true. For instance in a class of students or among factory worker, some new terms are always coined and adopted by that group. The process of forming new words is still in vogue. All of us know that the word “selfie” was recently added to our vocabulary and internationally accepted. This theory sounds reasonable but partially acceptable. Other primates like apes also live in groups but they did not produce any new language. So we can say that social interaction provides more conducive environment for language development but there are other reasons as well. The physical structure of human is well suited for speech. Human teeth are more balanced than any other mammal. Although these type of teeth are not very strong and can be used only for grinding and chewing yet they are very much suited for speech. The letter sounds like f and v are produced by using teeth. Other primates don’t have such teeth. Human lips are also more sophisticated and delicate to produce labial sounds like p, m and b. Human mouth is also smaller as compared to other animals thus well suited for frequent movement and making speech. Human tongue is also more flexible. So this structure was not only useful for biting, sucking and licking but also for making different sounds required for speech. Perhaps the biggest change of physical structure in human body is its upright posture. The upright posture not only freed our hands but also made very important change for speech. 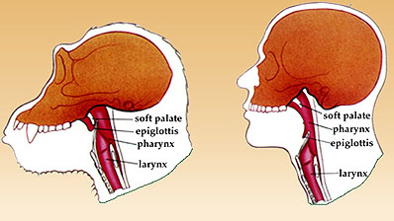 All other mammals have their larynx very close to nasal cavity but in human it lowered down due to upright posture thus creating more space for pharynx. The larynx is sound box containing vocal folds. These vocal folds produce sound and the sound is resonated and re-enforced in pharynx. 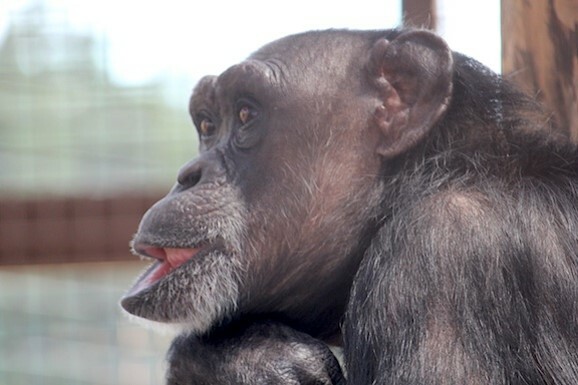 Since humans have bigger pharynx than all other primates, they are able to produce sound with more clarity and versatility. But human have to pay cost for this speech ability. Although lowering of larynx helped talking but it also created risk of choking hazard. 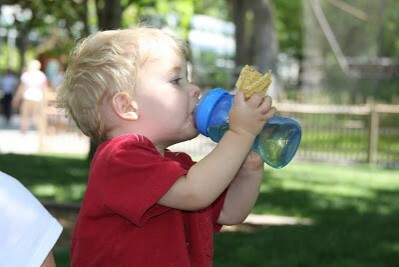 Due to the bigger pharynx and lowered larynx, there is always a risk of food going into wrong pipe. if food instead of going to esophagus (food pipe) accidentally falls into larynx it causes sneezing. And if something or food is choked there, death can happen under ten minutes. Therefor on most of the toys we find instruction as “not for children under age 3, choking hazard.” By the way, if some one’s throat is choked, he/she should immediately call for help. If there is no medical facility around, you should try to press the area just below the ribs by fist or something like that so that an upward pressure is built to throw our the clogged object. We should not try to remove the object by our fingers because most of the time this technique worsens the situation. Of course coughing is a natural response of body and we should try it ourselves as well to remove the object from throat. Keep aside this theory. We find this co-relation of hands and language in our daily life as well. While talking on phone, even though no body is around. We often move our hands while talking. Similarly while speaking any foreign language when we feel short of vocabulary, we start moving hands automatically to communicate. 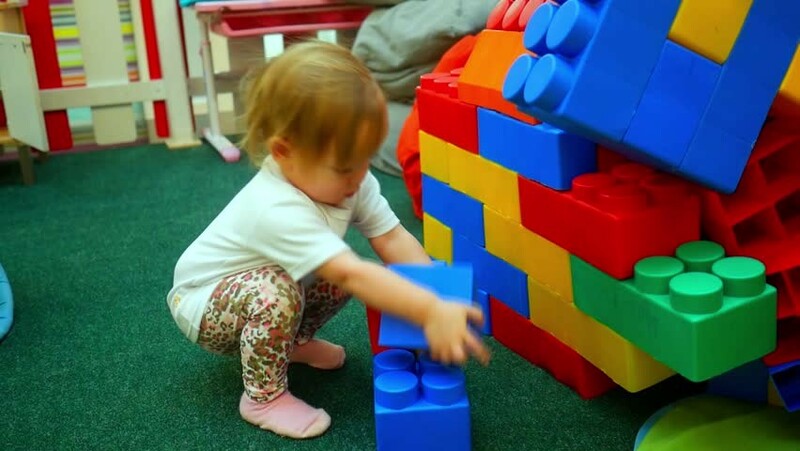 Further more the ability of a child to speak and to play block game is developed in same age. This theory says that human can speak a language as humans were built this way. In other words the language is on our gene. It is different from the notion that need is mother of invention. As some people say the language was invented as humans badly needed it to defend themselves from wild animals and to increase cooperation for hunting and farming. Other animals also need language for their group activity but they could not develop a language. So it is believed that humans have the language information built into their genome. When child is born he has only one fourth of the brain that he would actually develop over time. Also his larynx is attached to the throat making less space for pharynx. Therefor the new born baby like primates can drink milk and take breath at the same time. But, since, the new born human baby has that special genes of language, his larynx moves downward making more space for pharynx and at the same time enabling him to stand. The standing posture not only gives him bigger pharynx but also frees his hands. These are just theories, you can study them in detail yourself and can make your own independent opinion. Whatever the source of language may be. It is a fact that language is the most handy tool that we developed over time. It was not born with us like our eyes nose etc. Rather you may say it is a technology like aeroplanes and computers. The new generation can learn to use it oblivion of the fact that how many thousands of year it took to be developed. I believe if all the languages of the world die today. We would again develop new languages but again it would take thousands of years to reach such a versatile vocabulary of language. So all the languages are beautiful and were developed after the effort of thousand years. When a language dies, a whole history, culture and identity of a nation dies with it.